PARIS, France — Honestly, I cannot tell you (and no one outside Egypt can tell you) what comes next for the country. If the army has decided that Mohammed Morsi is no longer the head of state, well, Morsi’s probably no longer the head of state. That’s significant, and it’s probably the most significant moment since former Egyptian president Hosni Mubarak was ousted from power over two years ago in February 2011. It’s even more significant because Morsi himself elevated Abdel-Fattah El-Sisi to the top of the Egyptian military last summer. Revolutionaries who wanted a liberal democracy will be happy with today’s apparent putsch by the Egyptian military after days of illiberal restraints upon anti-Morsi protestors. Proponents of pure democracy, however, will be unhappy. After all, despite the dissatisfaction with Morsi, he was the duly elected president of the Egyptian electorate. Though Egypt now seems headed toward a state where a secular military ‘guarantees’ the Egyptian democracy — giving the Egyptian military the role that Turkey’s military played for nearly a century in Turkish democracy — it’s not certain that Egypt is anywhere near the end of its revolutionary tumult. If anything, its future is now more likely violent and uncertain. What comes next is incredibly unsure. In the immediate future, Aldy Mansour seems sets to become the choice of the Egyptian military as head of state. But who knows if the Muslim Brotherhood will contest that decision. In the meanwhile, keep an eye on two persons. The first is Ahmed Shafiq, who only narrowly lost the presidency to Morsi last year. He was quite clearly the preferred choice of the Egyptian military, and if it wants to install a leader with the most amount of democratic legitimacy, Shafiq is their man. 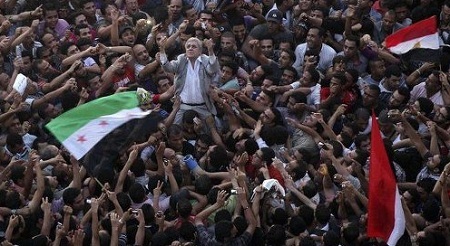 The other is Hamdeen Sabahi. If the army looks to place a civilian leader into power, it would be Sabahi, who placed a narrow third to Morsi and Shafiq in the 2012 presidential election, and who has assumed a position as the most credible opposition leader to Morsi. As a nationalist political leader, it was Sabahi who seemed like, more than either Morsi or Shafiq, the next potential Gamal Abdel Nasser, the only 2012 presidential candidate with the scope and ambition to chart a course toward a new era of Egyptian dominance of the Arab world. Egypt, it seems pretty clear, won’t put up with a government led by the Supreme Council of the Armed Forces for the next year. It has economic problems that, unlike in 2011, it can no longer push aside. Egypt needs a full-time president, with a full-time agenda for the Egyptian economy and, Morsi, with his increasingly pro-Islamist agenda, was simply not in a position to fulfill that need. The Muslim Brotherhood and Morsi have failed to make even the smallest progress. So the armed forces will be looking to the civilian most likely to succeed where Morsi failed — and that’s more likely than not going to be Shafiq or Sabahi. We’re in for a very long 48 hours or more in Egypt — no one can tell you what will happen. Uncharted territory.